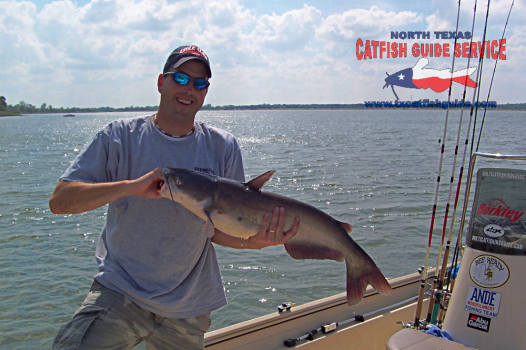 North Texas Catfish Guide Service offers guided catfish fishing trips on Eagle Mountain Lake in North Texas. 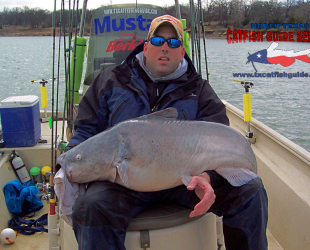 Our Eagle Mountain Lake catfish guide trips are a very popular option as the lake is close to both the Dallas and Fort Worth area and Eagle Mountain Lake is a sanctuary amongst the sprawling urban jungle in the DFW Metroplex. 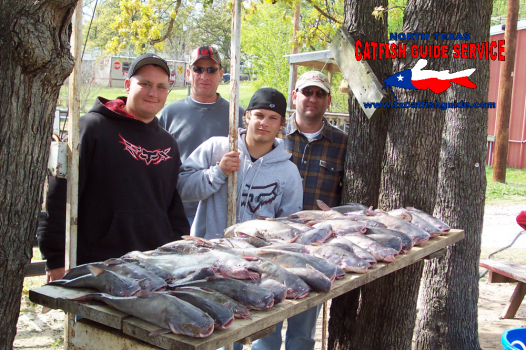 Many anglers prefer our Eagle Mountain lake catfish guide trips not only because of the excellent fishing for blue catfish, channel catfish and flathead catfish but also because of the local accommodations. There is excellent food and dining available on the water through a variety of restaurants and lodging is abundant. You can choose to stay in cabins on Eagle Mountain Lake or rent one of the many lake houses to stay for the weekend and enjoy your time on the water. Eagle Mountain Lake is located on the West Fork of the Trinity River, just North of Fort Worth and Lake Worth in Tarrant County. Eagle Mountain Lake is a short drive from most areas of Dallas and Fort Worth. Eagle Mountain Lake impounded in 1932 is an older lake that holds good numbers of Blue Catfish, Channel Catfish and Flathead Catfish and is also home to Trophy Blue Catfish. 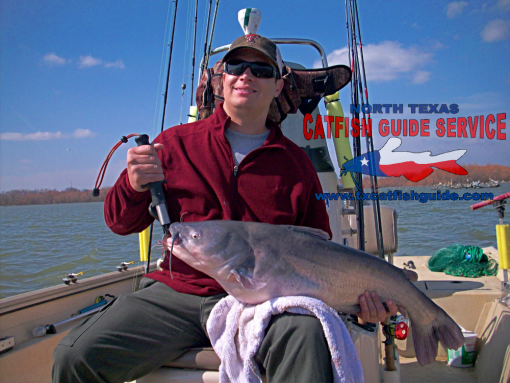 Although it is a small lake, it holds a lot of catfish and is a great option for a guided catfish fishing trip with North Texas Catfish Guide Service if you want to stay within a close proximity to Fort Worth Texas. 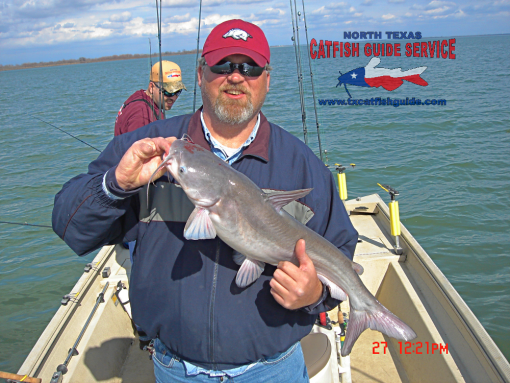 North Texas Catfish Guide Service launches at Lakeview Marina on the East side of the lake near Eagle Mountain Lake State Park. Trips are excellent all year round and we tailor the fishing trip based on what is biting best during each time of the year. Fall is an excellent time for catching both blue catfish and channel catfish on our trips and anglers can expect to catch good to excellent numbers of both species of fish on trips during this time and can often times catch some much sought after trophy class blue catfish on rod and reel. This is also often an excellent time to catch the much sought after trophy class blue catfish on rod and reel. The numbers of trophy class blue cats has really increased in recent years and this lake continues to produce excellent fish on our trips. 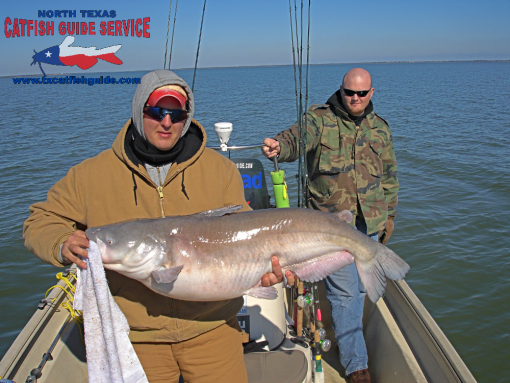 Winter fishing on our trips continues to be excellent for blue catfish and channel catfish. Flathead catfish are generally not targeted during this time. 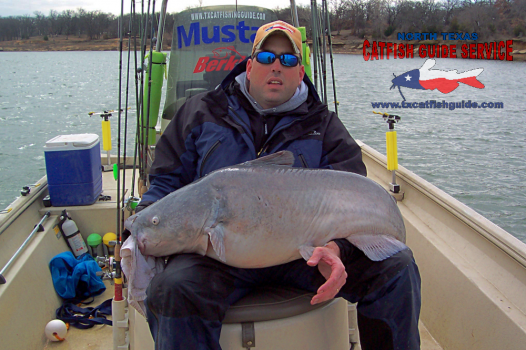 One of the most popular trips during this time is to target trophy class blue catfish on rod and reel but we can also produce excellent numbers of smaller blue and channel catfish during this time as well. Spring fishing with is one of the most popular times of the year for catching excellent numbers of blue catfish and channel catfish. The majority of our attention typically focuses on catching shallow water blue catfish and you can expect some fast and furious fishing action during March, April and May.